Jose Mourinho described Manchester City's quality as "untouchable" in the build-up to Sunday's derby, with his United side nine points behind the defending Premier League champions. But City's preparations for Sunday's derby at the Etihad Stadium have been disrupted by a series of allegations of financial impropriety, which Mourinho addressed at his pre-match news conference. German magazine Der Spiegel made a series of claims against City in an on-going series of articles based on documents purportedly attained from whistleblowers Football Leaks. Der Spiegel's reporting claims Sheikh Mansour's City regime topped up multi-million-pound sponsorship deals with Abu Dhabi companies, using their owner's fortune, in order to meet UEFA's Financial Fair Play (FFP) stipulations. 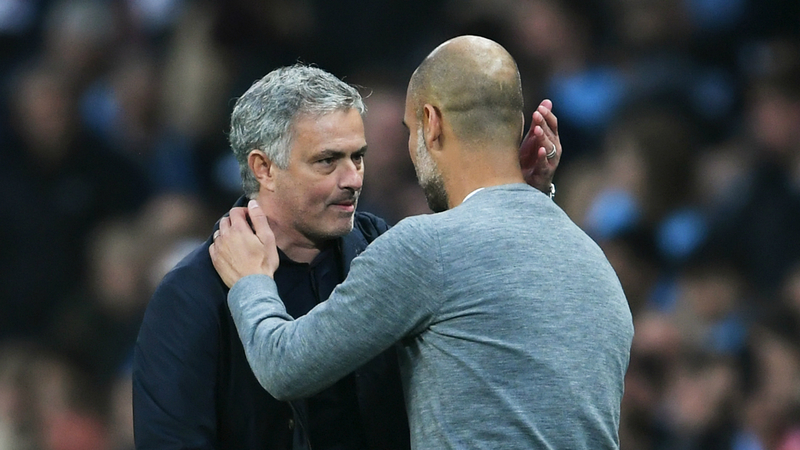 Guardiola has said City want to follow UEFA's FFP rules and Mourinho suggested the club's heavy backing of the former Barcelona head coach in the transfer market has moved them into a different league to United. "It's difficult for me to answer because I focus on my job, I focus on the four lines and I focus on football," Mourinho told reporters. "If you want to speak about their football potential we can speak and the football potential starts with investment. "After that there's the quality of the work and the organisation and I think that is untouchable, but what is behind I cannot say. "In this moment I have only to think about football and about Manchester City as the football team they are." The Portuguese previously indicated United - seventh in the table going into the weekend - cannot consider themselves in the title race until they climb into the top four. Mourinho's men cross Manchester already lagging behind their rivals, who won the Premier League title by a whopping 19 points last term, smashing a range of records in the process. And Mourinho said United are not focusing on the yawning gap between the two clubs in the build-up to Sunday's game. "If we draw it's nine [points] and if we lose it's 12 - it's not the way to look at the match," Mourinho said. "Just think about the match. "It's difficult enough as an isolated event, to put it in the context of where we are then it becomes even more difficult. "I want to play it as an isolated match against a difficult team. But I don't think they think it is an easy match for them." Last season's derby in April saw United come from two goals down to claim a 3-2 victory, inspired by Paul Pogba's double, although Guardiola's men still secured the title later that month. "I don't think it's special because of last season, it's special because it's the Manchester derby and it means what it means," Mourinho added. "We are going to try. I cannot say we will be successful in our motivations and desire, but we played two difficult matches away against two very good teams, Chelsea and Juventus, and we managed to get good results. "Even if the good results were not in our pockets the performances were there, the positive attitude was there, we are going to try. But Manchester City are a very powerful team."